I tuned down the keepalive timeout because of the recent spike in traffic. A few people might fall between the boat because of this. Dealing with slow connections keeps the server busy for longer than a fast connection would. I will tune these values further in the coming days. Either 10k people get their download finished within a reasonable time, or everyone will be punished for those few people (so far only you) with slower connections. Tweaked settings back to normal. 122MB at a capped 20KB/s speed running for nearly two hours, not a single timeout. I can't help you/your connection any more than this. Going by Davidinlv82's latest screenshot, the problem happens at hop 8 and forward, before reaching the DLC server. So it's something in between him and the DLC server. No, crossing the Atlantic ocean and seeing an increase of around 100ms is normal. Especially when the traffic needs to be delivered to people's homes (they usually get cheaper/slower routes). The problem is related to my server cutting off his connection because he's not responding in time, this time value being 60 seconds with the current configuration. Well you had the problem fixed and now its not working again, weird and entirely frustrating. I have a strange question though.... if I was to download it through the torrent doesn't it still come from the same place? Torrent is not HTTP, so it uses a completely different protocol to transfer data. Are you still having timeout issues? 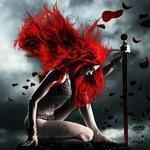 I am yes but I got the torrent file from Aslain and was able to apply it. All settings were back to when you didn't have the issues and you still have the issues. So the tweaks were probably a coincidence with a different issue. I'm leeching at a capped 250KB/s connection over tor and I can get a stable connection for over 45 minutes now. I'm amazed that you've not run into these issues on other servers outside the US. I'll investigate if you're not the only person out of the thousands that is having issues. Meanwhile there is a chance for torrent support in the installer, BegiN will try to implement it when he finds time. That would be awesome. I can't wait to see something that will work! my Girlfriend, same internet connection as i, had problems to download the UT anouncer and the EU_clanicons_Full. She retryed to download both and the UT Anouncer downloaded but noch the Clan Icons. The other member i didnt know what files he have the download Problem. But i try to find out witch files he cant download. But what happens? File is missing or ? In case of missing files, please provide file names that cannot be downloaded, they are visible on downloading window. Been having issues with specifically downloading the (recently added I believe) Witblitz Contour icons. 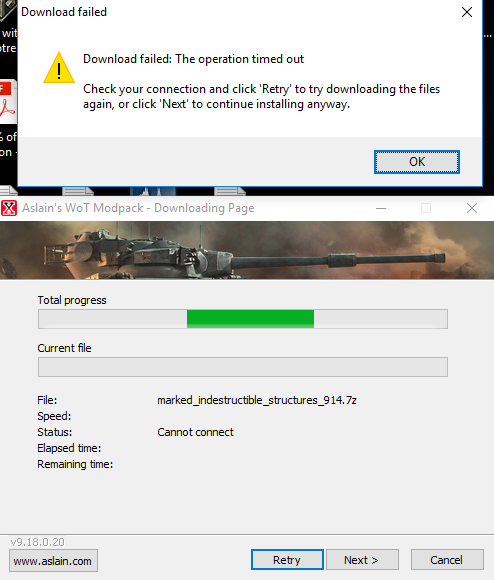 Only had the problem once 9.18 modpack releases. All other downloads seem to work just fine to include the icon's I resort to. Aslain's 3D icons with roman tiers. In looking into it, seems the name has changed in the .7z file that needs to be downloaded. The attempted download file is "contouricons_Witblitz_NeonAlt_9.18.7z" but it seems that the name has changed to "contouricons_Witblitz_Neon_Aslains_9.18.7z". It was fixed around 7h ago. is the dlc server down or is it just me?